If your week has started off running, this 25-minute meal is the perfect go-to tonight. Our Meatless Monday Recipe of the Day is loaded with fresh, juicy produce, like lycopene-rich tomatoes and artichokes, an excellent source of fiber, vitamin C, and folate. If your week has started off running, this 25-minute meal is the perfect go-to tonight. Our Meatless Monday Recipe of the Day is loaded with fresh, juicy produce, like lycopene-rich tomatoes and artichokes, an excellent source of fiber, vitamin C, and folate. 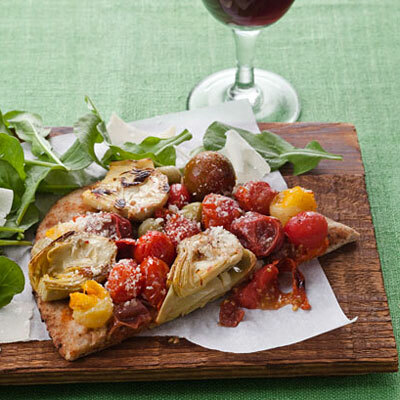 Parmesan adds a nice savory touch to the Roasted Tomato and Artichoke Flatbread Pizza, and the peppery arugula side dish provides plenty of vitamin A. Enjoy 2 slices of flatbread and 1/2 cup of arugula for only 277 calories.